A five seater hot tub spa, the Vita Spa Forte is perfect for entertaining or for complete relaxation, thanks to a massive 22 Graphite Jets powered bya 5hp pump. Benefiting from highly energy efficient insulation, M7 Heating, underwater lighting and programmable controls, the Vita Spa Forte makes for a tempting investment for your home or holiday property. Plunge into the deep 1188litre water of the Vita Spa Forte hot tub and you will understand why this is such a popular model for Bay Spas in North Devon. 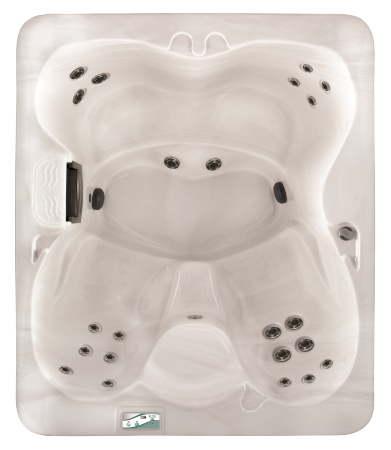 Featuring some 22 Graphite water jets, powered by a generous 5HP pump, this hot tub is perfect for those looking to relax and less the stresses of life ease away, allowing the powerful massaging seats reinvigorate and rejuvinate aching and tired muslces. Talk to hot tub experts Bay Spas today to find out more about the Forte and Vuta Spa range, or visit the showroom and try one out for yourself. The staff at the Devon hot tub showroom are friendly and knowledgeable and will be happy to help you choose the best hot tub for you.